after discontinuing their iconic Naked Palette. Inspired by the elements of nature such as earth, air, fire and water, this round palette with ultra-thin design presents 19 eyeshadows arranged in a special constellation of colors with multiple shades.18 eyeshadows and a special holographic shade that applied to any eye shadow transforms the finish making it unique. 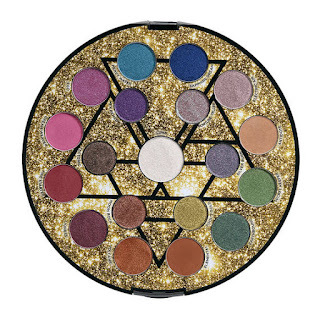 The colors, bright matt, holographic shimmer and multifaceted metal, gravitate around holographic shimmers, are presented in a spherical compact and arranged as a gravitationally bound system of the planets. The shadows - eight metallics, three mattes, and eight shimmers - are all orbiting Luna, a centrally-positioned iridescent transformer shade. 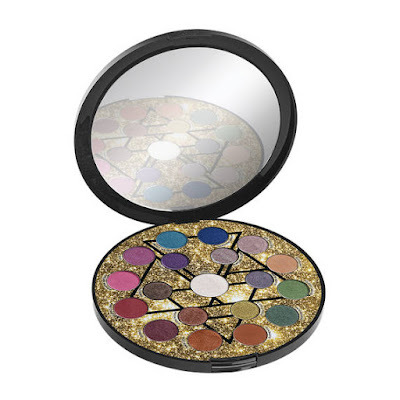 The magical round compact features a vibrant nebula-like print, while all the shadows are arranged in a circle set against a sparkling gold backdrop. 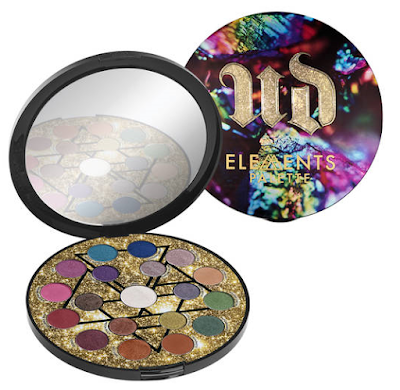 Urban Decay Elements Eyeshadow Palette launched today 10th September in America available from Sephora Release of the new palette in Europe should follow in a few days, available from leading Urban Decay boutiques, counters and online from here.